Going to a movie theater is always a fun kid activity, so why not have your kid's next birthday party at a movie theater in NY? The kids will have a blast watching the most recent kiddie movies, having some popcorn and soda, and hanging with their friends. Find all the local NY movie theaters that offer kids parties here! Want to host a movie party in your backyard? 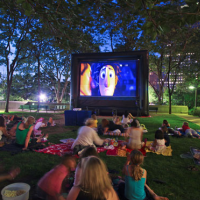 Find services in NY that provide inflatable outdoor movie screens. Rent a Private Theater in NY! If catching the latest blockbusters is one of your kid's favorite hobbies, then come to the Pavilion Theater for a children's movie theater party in NY! They will cater to your every want and need, and help you make your kid's party the best it can be. In the kid and teen party packages, each guest will get a customized invitation, an admission ticket, popcorn, a drink, candy, and more. Choose the Pavilion Theater for your kid's next NY movie theater party, and sit back and enjoy the party! Reserve a private theater and start planning the party today! Unlimited Popcorn & Soda in NY! A fun, family-friendly movie theater party place in NY, Concourse Plaza Multiplex Cinemas will handle everything for your kid's birthday party. They offer a dedicated party area for your guests and a party hosts that will keep the kid's entertained. 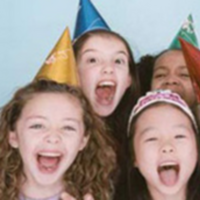 You can enjoy your kid's party with the help of Concourse Plaza Multiplex Cinemas' friendly staff. You will receive a birthday party package that includes unlimited popcorn and soda, invitations, a movie of the birthday kid's choice, reserved seating, and more. Make your reservations today for your kid's NY movie theater party at Concourse Plaza Multiplex Cinemas. Invite up to 27 Guests in NY! 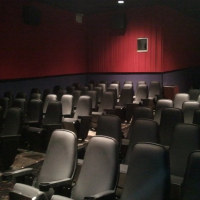 Rent a private movie theater screening for your kid's next NY movie theater birthday party at Sayville Cinemas! The birthday party package includes a private screening, unlimited popcorn and soda, supplied paper goods, a host/hostess, and an option of pizza for an additional cost. 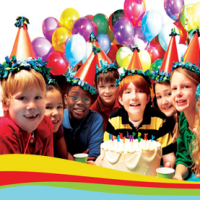 Pay an affordable flat rate for up to 27 people, so your child can invite a whole bunch of friends! 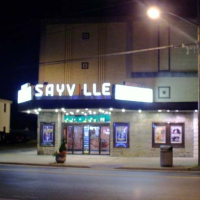 Whether you're having your party on the weekend or during the week, Sayville Cinemas will accommodate your needs. Three Movie Party Packages in NY! With three party plans to choose from, Clearview Cinemas is a top-notch kid's movie party place in NY. Book a walk-in party that will take place during regularly scheduled show times; rent an entire auditorium with the standard private party package; or have a private party inside a private theater with the premiere private party package. Included in the packages is a movie ticket, popcorn and soda. 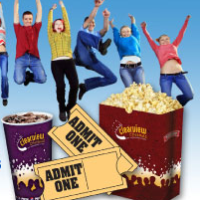 Clearview Cinemas guarantees an unforgettable party for your son or daughter. Beautiful Architecture at this Theater in NY! With seven beautiful theaters, the Village East Cinema is a perfect location for a movie theater birthday party in NY. 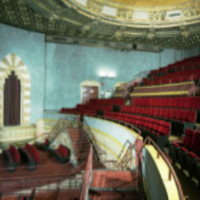 You will absolutely love their comfortable and convenient auditorium and large lobby space - they will make your kid's movie theater party in NY just what you had imagined. Featuring two newly-renovated concession stands on both floors of the cinema, your guests are sure to not go hungry during your private movie party at Village East Cinema. Serving Queens, Long Island & Brooklyn! 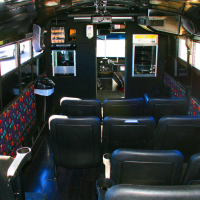 Book an all-inclusive movie bus for your kid's next movie themed birthday party in NY! Bus a Move is a unique and once-in-a-lifetime party experience that is a guaranteed hit among kids and adults. In the Bus a Move package, you will get three pizzas, unlimited popcorn, juice boxes, a projection screen, real movie seats, surround sound audio, and more. Sit back and relax during your kid's NY movie party with Bus a Move. They will do all the work in serving and entertaining the kids, so parents can have a great time too! Your Kid will be a Star for the Day! With numerous New York locations, UA Staten Island Stadium is a top-notch kid's movie party place in NY. At most locations, you can rent out a cool, decorated party room that the children can eat and hang out in after the movie. UA Staten Island Stadium is a guaranteed hit for kid's parties. Start planning your kid's NY movie theater party now - go to their website and a time and place, and UA Staten Island Stadium will make accommodations for you! Have a Backyard Movie Party in NY! You can throw your kid an at-home movie party in NY with Funflicks Outdoor Movies! Whether you are inviting 5 guests or 5,000 guests, FunFlicks will make the accommodations for you. Choose between the various movie screen sizes, including indoor, backyard, premiere, blockbuster and elite. Serving all of the Upstate New York area, FunFlicks will help you in planning your kid's NY movie themed party, and will make it so the party is a fun and memorable event.